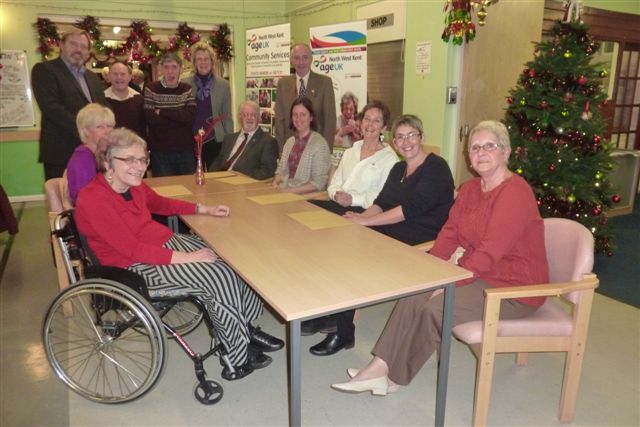 At the Age UK Centre, in Clarence Row, Gravesend on Wednesday, 4th December, the Rotary Club of Gravesend were once again distributing donations to the unsung heroes of Gravesend. At this annual event, some of the money raised by our club’s “On Your Bike” bicycle ride in April is given to small locally based charities that care for the people of Gravesend. These charities, many of which are totally dependant on volunteers, help the old, support the needy, care for the sick, safeguard the young, give shelter to the homeless. If you would like to see us continue to support these charities, as well as the EllenorLions Hospice, why don’t you have a fun day in April, get your bicycle out in April and join the hundreds of people down at the Gravesend Prom. Why not get sponsorship to go for a family ride of 15 miles, or maybe 30 miles if feel a bit more energetic, or you could really go for “the big one” of 45 miles. If you can’t ride a bicycle, you could get in touch with us and become a friend of Rotary for a day and help at one of the checkpoints. For full details go to our “On Your Bike” website. 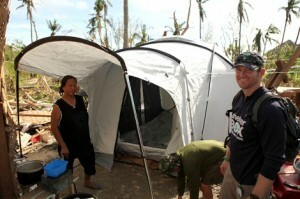 There has been a fantastic response from the public to the disaster in the Philippines. Members of the Rotary Club of Gravesend responded by collecting money to send ShelterBoxes to families that have lost their homes. They were in Gravesend town centre on the 16th November showing off one of the special tents and the other contents of ShelterBoxes. Thanks to the generosity of the people of Gravesend over £1,500 was raised and, with the addition of further money from Rotarians, £1,800 was sent to ShelterBox to buy three ShelterBoxes. This is a terrific result that I know will make a difference to the lives of at least 3 families, if not more. The support you give to ShelterBox is outstanding –please convey my personal thanks to the Club, since because of donations like this I am hopeful I will never again be in the position of being unable to help deserving families I have the privilege to meet in the field. I am being deployed to the Philippines next Wednesday so it’s good to know that others are equally supportive of the small contribution I will be making by donating my time and energy over the next few weeks. Since this collection our team has visited two primary schools to tell them about ShelterBox and seek their support. Service Above Self – the motto and ethos that the Rotary Club functions under and Nigel Coombes, the evening’s speaker, chose this as the base point for an evening of informed discussion. The audience relished the open and thought provoking way in which he embraced the motto’s relation with numerous religions, with politics, with ethics and with many other subjects. I feel certain that everyone at that evening meeting at the Mid-Kent Golf Club on the 7th October left feeling mentally invigorated by the open and frank debate. Thursday morning, overcast and with a rather cold rain in the air, it didn’t look that promising of our days golf at Whitstable & Seasalter Golf Club. Packing some warm water-proofs along with the clubs, it was off down the M2 to the seaside. By the time we were on the Thanet Way, the weather was clearing and the temperature rising and we arrive just as the sun broke through the clouds. Walking into the clubhouse, we knew we were in for some hard graft when we saw the local golfing elite. But then there was worse to come as we spied the old adversaries – G&M (Rotarians from Gravesend and Meopham)….it was going to be a really tough to take any of the day’s honours even for the cream of our plays like Kevin or Simon. By the time we were on the first tee, the temperature was rocketing and there was hardly a cloud in the sky and the challenge was on. Out in the midday sun we hooked, sliced and topped our balls with incredible regularity and were amazed at how easily they disappeared into the countless ditches but even so, we were not deterred. By the time we were at the turn, we knew we were on the up, especially as we felt the calling of the 19th. With the card finally complete, signed and handed in, it was off for a shower and then to the bar to tell of the unbelievable puts and the disastrous drives. The banter over the meal finally reach fever pitch as the prizes were given out and you can imagine our delight as it was announced that the best score for the back nine was our very own “friend of rotary”, young George. A great day was had by one and all and our thanks go to Dave Annal for organising the event (and we even raised over £100 for charity). The cry was heard…….. the challenge accepted………. 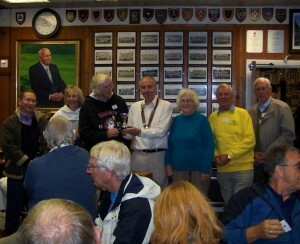 and over 60 Rotarians, family and friends arrived at the Gravesend Rugby club for the Annual Rotary Petanque Challenge. The tension was high as the teams from the Gravesend & Meopham, Northfleet with Ebbsfleet and Gravesend clubs grabbed their boules and headed off to do battle. Youngsters like Charlie Trimm were in the melee and accounted for themselves well against the seasoned veterans of French holidays like John & Dot Baker. No quarter was given as the light faded and the night air chilled. Mike Cubitt and his team of wonderful helpers refereed the matches and kept league tables and it was only when we were all back in the clubhouse did Mike tot up the scores. Taking sustenance from the magnificent buffet and quaffing a glass of red French wine (or two) we waited for Mike to announce the final score, which was…..
President Adrian concluded the evening official formalities by presenting the Rotary Petangue Challenge Cup to Northfleet with Ebbsfleet along with the mantle of organising next year’s challenge. Fortunately this did not interfere too much with the main purpose of the evening which was of course….FELLOWSHIP and catching up with good friends. Sunday the 18th August, it was just after mid-day and the “Gravesend Trappers” were ‘chilling out’ before they took up the annual Bat & Trap challenge that had been laid down by the dreaded “Rochester Batters”. President Adrian, with a glass of red wine in his hand, got up and said “Follow me lads” as he led us onto to field of play. With a toss of a coin, us “Trappers” were put into bat first and managed a magnificent 33 points before we were all out. It was then that the “Rochester Batters” showed us why they are faced with such trepidation, they battled, they slogged, they batted in sunshine and in showers managing a match winning 36 all out. After the match we had a lovely meal in the marquee, which with the presentations, concluded a truly wonderful day. Despite losing by the narrowest of margins, the “Gravesend Trappers” (i.e. 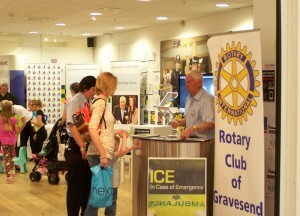 the Rotary Club of Gravesend) would like to thank the “Rochester Batters” (i.e. 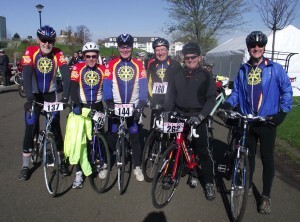 the Rotary Club of Rochester) for their hospitality and fellowship – and look forward to next year’s challenge. The Club is moving to a new meeting place with effect from 2nd September. The Monday lunch meetings will be at the Mid Kent Golf Club in Singlewell Road, Gravesend. It on the edge of the town, close to the A2 main road and has plenty of car parking so it will be easier for most members to get there. And the food has been recommended! This follows many years meeting at the Masonic Hall in the centre of the town. Previously, during its 86 years, the Club has met at the Woodville Halls, The Woodlands and Williamsons Café. 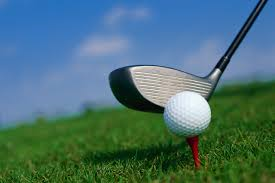 Click here to find out how to get to the Mid Kent Golf Club. 28 April 2013 – A fine sunny day brought 820 cyclists to Gravesend promenade to join in the annual On Your Bike sponsored bike ride. Some were casual cyclists or groups of friends wanting a leisurely ride in the countryside, some were families and others were keen cyclists. All were there to raise money for local charities. They had a choice of three routes, 15, 30 or 45 miles, selected with the help of the Gravesend Cyclists Touring Club to suit a wide range of abilities. The shortest went along the canal path to Lower Higham, up to Cobham and through the village past Jeskyns Park over the A2 and into Gravesend. The 30 mile route started the same way but from Cobham went on to Luddesdown, Harvel, Stansted, Ifield and back into Gravesend. The longest route started a different way going to Lower Higham via Chalk then to Cliffe, High Halstow, Hoo, Chattenden and joined the 30 mile route at Cobham. All those who completed the course returned to the Promenade to receive a certificate and a slate coaster – many already had a collection of these from previous years each with a unique design. Those returning sponsorship money by the end of August will also be entered in a draw for a bicycle presented by Tri The Bike Shop of Gravesend. This was the 27th year that Gravesend Rotary Club has organised the event which has become an annual “must” for many cyclists over a wide area. During this time over £450,000 has been raised for local charities. This year the main charity is, again, the EllenorLions Hospice. The other charities will be chosen later in the year. Initial estimates suggest that at least £12,000 will be raised for these charities but it is usually several months before all the money comes in. The Club enjoys working with several organisations who make the event run safely and smoothly. 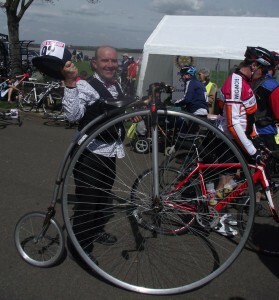 These include: Gravesend Cyclists Touring Club which lends its expertise in organising the route, Medway Raynet provides radio communications, St John Ambulance provides emergency medical cover and several Rotary and Lions clubs provide volunteer helpers. April 2013 – Six Rotarians and young George set off from Gravesend for Sene Valley Gold Club at first light on on Thursday 18th April, a rather dismal morning. We were all fired up to uphold the honour of the Gravesend “Kentish Men” in the heartland of the “Men of Kent”. After some strong black coffee we were finally awake enough to set off into the dawn mist – our premier players in the “Old Gravesendians” looking like they should be in Augusta while was Adrian trying frantically to make our other players in the “Loose Cannons” look as thought they had played Golf at least once before. The “Old Gravesendians” did us proud but unfortunately not enough to win the day but on the 4th , their star player Eamonn did gain victory for the longest drive. Under Adrian’s tutorage the “Loose Cannons” did battle valiantly and with the help of a “ringer” (the Mayor of Hythe) managed to complete the course. We all had a wonderful day – the weather was kind to us, the golf was good and the hospitality and fellowship of the Rotary Club of Hythe was fantastic and to cap it all, over £1,000 was raised for local charities.